Organise your Wedding, New Year's Eve, or a Birthday party like a professional. Thanks to Interactive Wall, otherwise media / large companies exclusive services are now at your fingertips. It is not always easy to find an original idea for your wedding and make outstanding memories for all your guests. Interactive Wall breaks the ice between guests: they can easily send photo memories or personal anecdotes. After your ceremony, relive the party and find all the messages and photos of your friends and family. Of course, you can personalise your projection according to your tastes and desires, and harmonise it with the theme of your marriage. Groomsmen, Bridesmaids : make the newly weds a special surprise ! Fed up with PowerPoint presentations or homemade videos? Setting up a special interactive wall will prove more pleasant and participative. The projection is interactive: guests send their messages (text or photo) directly on their smartphones. After a few drinks on the dance floor, the anecdotes will start coming and the atmosphere will warm up. Don't worry, you can moderate all messages before their display. You are organising a surprise party for your best friend's 30th birthday party. You have the basics: cocktails, music... but you are still looking for the special ingredient to spice up the party. Your interactive wall will have everyone enjoy and share more fun even from the very beginning of the party. Centralise the photos taken during the party on the wall and find them the next morning in your guestbook. It is up to you to organise the party for December 31. Whether you have rented a space or privatised your living room, Interactive Wall guarantees a successful transition into the New Year. 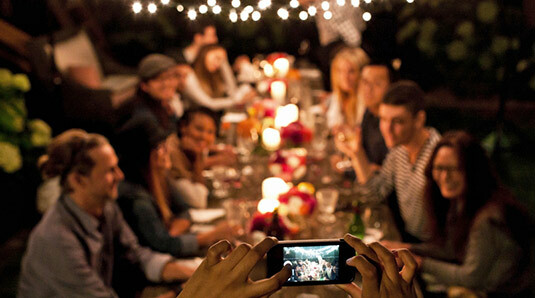 It is also the best way to share photos taken during your New Year's Eve party and best wishes for the year to come. How does moderation work ?